Editor's note: An earlier version of this story had the wrong date for the in-vehicle debut of the EyeQ4 chip. The story also contained inaccurate information about two automakers planning to offer a technology made possible by the chip; that line has been deleted. As automakers equip vehicles with collision avoidance technology, obstacle detection software has become a must-have pursued by nearly every megasupplier of safety equipment. Yet, the hottest entrant in the field is Mobileye, an Israeli company with only 500 employees. Since its first camera-based lane-departure warning system debuted on the Volvo S80 in 2007, Mobileye has introduced camera-based vision systems that read traffic signs and stoplights, monitor lanes, detect pedestrians and spot obstacles in front of vehicles. Mobileye has become a Wall Street darling. The company's initial public offering last summer raised $890 million, a record for an Israeli company. To co-founder Amnon Shashua, it all starts with how the human eye sees. "Human vision is primarily monocular," says Shashua, 55, a computer science professor at Hebrew University in Jerusalem and an authority on machine vision and artificial intelligence. "You have two eyes, but if you shut one eye, you don't go blind. You can navigate in the visual world with one eye." That precept underpins Mobileye's technology, which is used by 23 automakers. Mobileye, a Tier 2 supplier, usually sells its chip-based systems to Tier 1 companies such as Delphi Automotive and TRW Automotive Holdings Corp. Mobileye won't sell its chips to direct competitors such as Continental AG and Robert Bosch GmbH, Shashua says. Mobileye software is embedded on the company's EyeQ chip, now in its third generation. Mobileye's latest EyeQ3 chip launched in the Audi Q7 and the Volvo XC90 in the first quarter and is scheduled to launch in seven more models this year. "Our chip receives the video feed from a camera and processes this video to find vehicles, to find pedestrians, to find traffic signs and speed limit signs, to find traffic lines and also to support automated driving," Shashua says. Mobileye came into existence almost by accident. In 1999 Shashua was working on an unrelated startup that had developed optical sensors that could reproduce parts with high accuracy. After making a presentation about his company's concept to engineers from the Japanese auto industry, Shashua was asked whether stereo sensors could be used to detect objects in the road. Shashua's answer took his hosts by surprise: "I said you don't need to build a stereo system." They were skeptical, but Shashua persuaded them to give him a small grant to prove his thesis -- that a monocular camera would be cheaper to build, require less computer processing power and have better performance than a stereo camera. Shashua realized the opportunity: "Because of the low cost of the system and the fact it would save lives, at some point in the future these systems would be mandated." 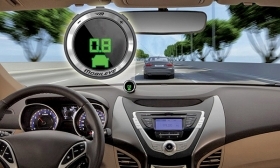 The capability of Mobileye's chips has grown by leaps and bounds. Last year, for example, its software could recognize 40 traffic signs in 25 countries, Shashua said this year during an investor conference. By the end of this year, Mobileye's software will recognize 1,000 traffic signs in 100 countries, he said. According to Mobileye's quarterly financial report, customers installed its chips in 816,000 vehicles in the first three months of 2015, bringing the total of Mobileye-equipped vehicles to more than 6 million. During its earnings presentation, Mobileye said it had won two new manufacturer contracts. Mobileye did not identify the automakers. The next phase in the evolution of autonomous driving is "deep learning," Shashua says. That's when the computer moves from being able to identify individual objects on the road to making a holistic interpretation of the entire scene. That would enable a vehicle to drive itself safely on a snow-covered road without visible lane markings. Mobileye's software has become increasingly adept at identifying and classifying objects in the road. But the human brain is still much more sophisticated at creating the context, including the entire road environment. As the industry prepares to introduce partially autonomous vehicles that can change lanes on the highway, Mobileye is moving to trifocal camera systems. These systems would require three monocular cameras working together focused at different widths and depths to approximate a driver's view. One camera would have a narrow 20-degree field of view to see what's coming far down the road. A second would have a wide 150-degree view to see what is around the vehicle. The third would have a midrange 50-degree view. To handle all the data, the company has developed the EyeQ4 chip, which can analyze images from as many as eight cameras. It is due to appear on vehicles in 2018. Shashua believes computer vision is improving quickly and that the safety benefits will be significant. Because it saves lives, regulators will tie a vehicle's star rating to its collision avoidance system. "Let's say your car knows you're incapacitated," Shashua says. "So now your car, instead of being involved in an accident, will take over and slow down. Something like this is worth tying to star ratings. Driverless cars will save lives."